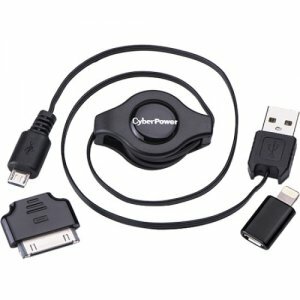 The CyberPower iDevice USB cable kit contains adapters for use with old and new Apple devices. Charge and sync your Apple iPod, iPhone or iPad by connecting the retractable cable to a PC, laptop or USB charger using the adapter for your iDevice. A Three-Year limited warranty ensures the iDevice USB 2.0 Kit is free of defects in design, assembly, material or workmanship.